Diversification [dih-vur-suh-fi-key-shuh] noun: the act or practice of manufacturing a variety of products, investing in a variety of securities, selling a variety of merchandise, etc., so that a failure in or an economic slump affecting one of them will not be disastrous. The economic slump referred to in the definition of diversification translates to supply chain as tight capacity. If you are only using an asset-based freight service high demand means, inevitably, you are going to face a disruption to your supply chain, impacting your company’s profitability. When you diversify your freight providers by adding the right 3PL to your mix, you are getting access to capacity in any lane at any time, making your supply chain agile and adaptable. The result will be increased performance and better cost control throughout your supply chain. Keep your options open. 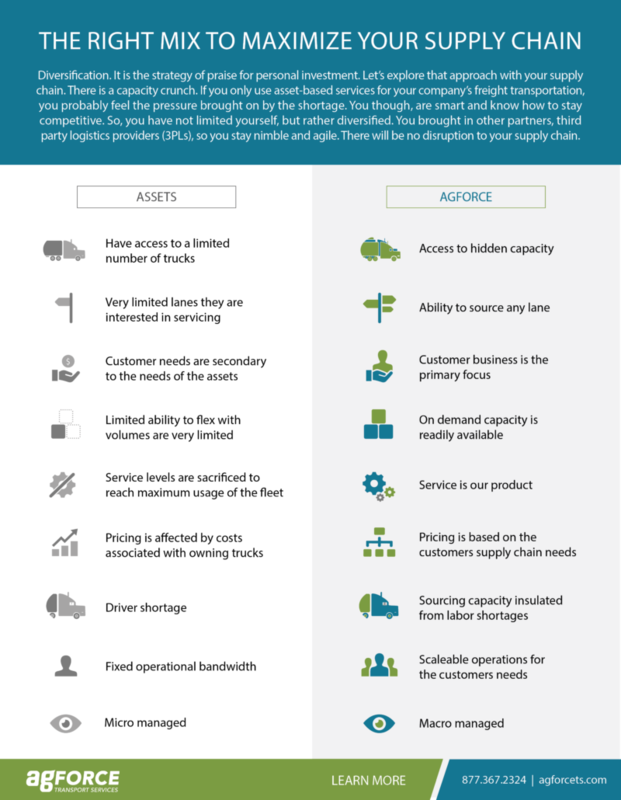 When you partner with a 3PL, they can help you find capacity that an asset-based provider may not have access to. Service is their product. With that mindset, they can help you build the perfect mix of capacity and cost control to optimize your supply chain. Agforce can help you maximize efficiency and avoid disruption to your business. Together, we can deliver the right mix for a nimble, agile and profitable supply chain. Give us a call at 877.367.2324 or email us at inquiry@agforcets.com. Safe. And on time. That’s how your freight should deliver. But we all know damage can happen and we need to know how to handle it. Let’s talk about the things you can do to help ensure your freight arrives safe, as well as the need-to-know information if indeed you find yourself staring at a freight claim. Stacking: Load your heavier freight on bottom while your more fragile cargo is safely on top. Protection: Block and brace your freight to lower risk of movement during transit. Distribution: You will want even weight across your pallets, and a weight distribution board is needed between every third layer of freight. Uniformity: Stack pallets in a consistent manner and keep a lookout for product overhang. Photograph: Snap a quick pic just in case you would need to prove the condition of the freight at time of pickup. This is important: Do not let the driver leave until you have inspected the freight. On the exterior, you’ll be looking for things like fork punctures or crushed packaging. Don’t stop there though, go ahead and open it up. If you do find damage, take pictures and note “DAMAGE” on the delivery receipt. Then both you and the driver will need to sign that document. The freight can be refused if there is damage. However, this may not be in your best interest. It could hold up the payment of a freight claim if neither the consignee nor the shipper are in possession of the freight and it is left with the carrier. If both the shipper and consignee refuse the freight, the carrier can claim ownership of the property. It is typically best to note all of the damage and accept the shipment. The carrier received the freight in good condition. The consignee received the freight short of original contents, there was damage, or it delivered unreasonably late. The dollar amount of your claim is valid. To no extent were they negligent. The damage was due to a recognized carrier defense. Only when the carrier fails to meet their burden are you entitled to recover the loss. Remember, it is based on actual loss, if an item can be repaired or a part replaced, that may influence the compensation amount. Involve your insurance company, they may be able to assist you in further recuperation of loss. Freight claims can be a large pain, and if you do not know the subtle nuances that go into the process, they are nothing short of overwhelming. Be diligent in your shipment preparation, thorough with your paperwork and mindful of inspection at delivery. Hopefully your freight always arrives safe and on time. However, if an accident does happen, you will be prepared to face it head on. Don’t forget to lean on your freight service. Agforce can help you understand the claim process and serve as a go-between with the freight carrier. Together, we can better navigate the freight industry. Give us a call at 877.367.2324 or email us at inquiry@agforcets.com. 2018 was a big year for precision railroading, and that’s an understatement. Some might go so far to say it was a “make or break” year, and I would have to agree – as long as those people also agreed that by December 31, 2018, we could conclude precision railroading probably checked all the boxes on the “make” side of the equation. Of course, that growth did not necessarily come easy for any of us. According to the Association of American Railroads, intermodal volume rose 5.5 percent in 2018 alone. At Agforce, we experienced that growth firsthand with our partners. By the end of the year, it had become clear that precision railroading is well positioned to go mainstream in 2019, but not without a few growing pains. Thanks in large part to a confluence of factors that included precision railroading and tight trucking capacity, CSX, for example, struggled with delays and the resultant frustrated shippers on the precision railroading side. Thankfully, CSX adjusted to the “new normal” quickly, modifying and improving service to accommodate pared-down service routes and closed ramp facilities. The use of the word “quickly,” by the way, is highly relative. It did not take CSX long by railroad standards to make some high-impact, significant changes, but to our customers, it felt like an eternity. We were relieved in October 2018, when we started seeing glimmers of the positive angles of precision railroading strategy emerge not just for CSX, but for our intermodal partners as well. The shifts and evolutions that came in 2018 created an intense need for not just data, but the best data and the best analytics to go with it. Agforce brought both last year and is prepared to do so again in the coming year. Precision railroading can be difficult to deal with on the client side when a railroad first engages in this format. Done right, the strategy dramatically increases efficiency and optimizes use of assets across the board at a railroad, but the implementation period can be rough. CSX picked a rough time to implement precision railroading, in the middle of a tight truck market, since companies were already looking for options to get product off their docks and onto the road or, instead, the rails. When engaged in successful precision railroading, a railroad like CSX may “shed” operations (including ramps and associated operations) while expanding profits all the while. This can complicate things for shippers to no small degree. “CSX has more pricing power [now]…particularly in intermodal truck-rail business,” wrote WSJ business editor Paul Page this past October. Precision railroading provides more pricing power for the rails but also causes massive operational changes which makes having a solid strategic partner that much more imperative. The ensuing volatility certainly had a huge impact on our industry in 2018, but we expect things to calm down in the coming year. What does this mean for Agforce customers? As precision railroading grows in popularity (and it will with results like CSX is posting), it will be imperative that every company have a highly optimized intermodal strategy. Whether you have had the same basic process for years and are in need of a “revamp” or you have only recently begun working with or considering intermodal shipping, rely on Agforce to help you develop and optimize the intermodal strategy right for you. Fortunately for the entire industry, 2019 will probably not be quite as volatile as its predecessor. At Agforce, we do not expect the same volume of rate increases that we saw in 2018, which were caused by the coupling of a very tight truck market and the emergence of precision railroading as a dominant trend in railroading. Intermodal growth in 2018 was definitely fueled by tight capacity in the truck market, but now it is certainly here to stay. The trucking industry appears to be taking a pause of its own as 2019 begins, another positive indicator for you that rates on this side could settle in the coming months. After a huge surge in fleet expansions, orders for heavy-duty trucks in North America were 43 percent lower in December 2018 than they were a year prior and down 24 percent month-over-month, ACT Research reported in early January. However, ACT vice president Steve Tam observed, order volumes are not so low that the hot freight market could be heading for a downturn. “Freight demand is still growing. Freight demands are still increasing; it’s just that they are growing at a lower rate,” he told WSJ. This certainly correlates to our own outlook, with the caveat that this applies mainly to lanes that still “fit” railroads’ new operations. Be alert: precision railroading can create logistical issues if a railroad’s new ramp pairings do not fit with the network customers are used to. Agforce is dedicated to helping partners identify the best fits between providers and customers and also between rail and trucking providers as this evolution continues. At Agforce, we have shifted historical business to rail in many cases due to pricing or capacity constraints. This service shift and the ability to meet demand has made rail a better fit for our customers in certain cases, and those instances are increasing in number as more railroads nail down precision railroading and the positive results it can bring. It is imperative your logistics partner is doing constant, analytical due diligence for you. This is what Agforce does for its customers. The good news is we don’t expect the spot market to stay up where it is right now. In fact, we’re predicting it will come down while contractual rates rise a modest 3-5 percent in lanes that continue to fit the railroads networks. Agforce continues to carefully and consistently monitor service provider, freight volumes, ramp pairings and schedules to help you optimize your shipping strategies. Untiring attention to detail in this will play a key role in your company’s successful shipping, regardless of mode or combination of transport methods, in 2019. Together, we can leverage 2019 to your advantage. Let’s partner and create solutions for your business. Give us a call at 877.367.2324 or email us at inquiry@agforcets.com. Andy Tuley is the Vice President of Business Development at Agforce Transport Services. Tuley’s long history of work in the logistics and supply chain industry coupled with skills in freight, sales forecasting and P&L management uniquely qualify him to provide Agforce customers with the strategic industry analysis they need each quarter and in the event of industry disruption. A suspected crew of cargo thieves followed a truck from a local warehouse. The truck didn’t go far, parking just a couple of miles away. Detective Gerardo A. Pachuca of Los Angeles County Sheriff’s Department’s Cargo Criminal Apprehension Team (Cargo CATs) had the crew under surveillance. He reached out to the driver to let him know the thieves were tracking him — that shipment remained safe. The following week on the same route, and same parking lot, the trailer was left unattended. The thieves had their window. They took the entire trailer. In the same article by Transport Topics, Pachuca warned about the sophistication level of cargo thieves. They are organized often working as a crew, where they stake out specific goods and their corresponding warehouses. Here’s what you should know. 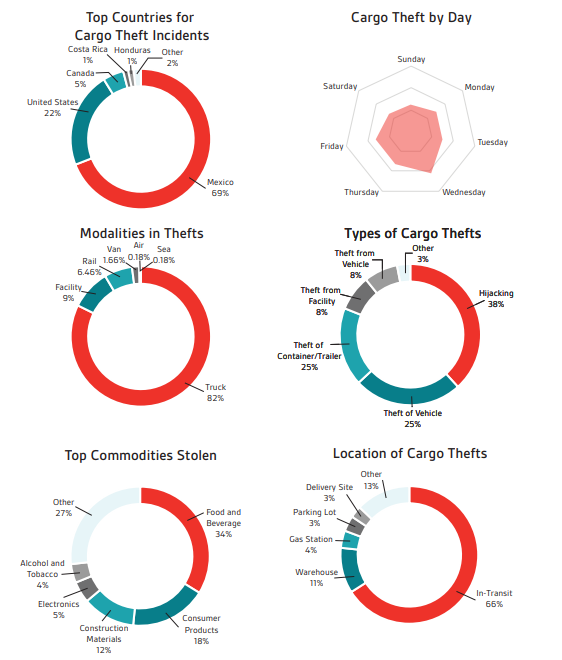 The joint 2018 Semi-Annual Global Cargo Theft Intelligence and Advisory Report published by the TT Club, leading provider of insurance and related risk management services for the logistics industry, and BSI Supply Chain Services, leading global provider of supply chain intelligence, auditing services, audit and risk management compliance solutions and advisory services, revealed large growth in cargo theft and crime, reporting 24 percent of global cargo theft resulted from violent truck hijackings, with 27 percent of those incidents targeting food and beverage. Scott Cornell leads Travelers Insurance transportation business and helped create its cargo theft investigation unit more than a decade ago. In this recent article, he talked through strategic cargo theft, which employs deceit and results in carriers and shippers unknowingly handing over their loads. These thieves may pose as a carrier or broker, finding their target commodities and companies by matching them with the location of available cargo on public load boards. To steal the identity of legitimate carriers or brokers and bid on these loads, they may have posted fictitious loads where they can capture legitimate credentials during the bid process. Friday afternoons, when companies are most pressured to get freight off the dock, may present the highest risk of falling victim to this strategy. The thieves hope the stress of getting the freight moving may lead to less scrutiny of credentials at pickup. Are there additional safety procedures you should consider for your freight? Give us a call at 877.367.2324 or email us at inquiry@agforcets.com. We can talk about your current processes and identify risk. Let’s prevent cargo theft, together. https://agforcets.com/wp-content/uploads/2019/01/cargo-theft-compressed.jpg 321 835 Jen Whitson https://agforcets.com/wp-content/uploads/sites/9/2015/07/Agforce-Transport-Services-logo.png Jen Whitson2019-01-08 10:27:232019-04-17 21:04:30Cargo Theft: Is Your Freight at Risk? When you can, break your spend out by mode. This will help pinpoint your savings potential and give you data to measure against. The particulars will help freight providers create tailored solutions for you. Document your freight’s handling requirements, load time, standard weights, pickup and delivery times. Providers will also want to know if you have driver-friendly facilities and how quickly you pay. It is also beneficial to document the efficiency of your check-in and check-out process. This is where you define your expectations for the RFP. What do you hope to achieve? Freight services want to provide the information you are looking for. This will help both your organization and those invited to bid to act with intention throughout the process. The number of rounds in the RFP process helps those bidding understand your communication cadence and informs their own strategy in regard to winning your business. Pro tip! Gather visuals of the products you ship. Part of your job is to make your freight attractive to the service provider. They need to want to move your freight. Your carrier strategy likely includes a mix of carriers and third-party logistics companies (3PLs) — small, large, national, regional. The tender percentage awarded to each is deliberate and likely based on the requirements of your freight. Bring this same thought process as you determine the invite list of your RFP. You want a good mix to help you thrive in a changing logistics landscape. Balance this group based on fit with your supply chain operations. How does our freight fit into your network? Where will we rank among your clients in freight spend? Are we aligned on KPIs? Have you done X before? Whatever your freight requires, make sure they have handled that situation in the past. As you are compiling this data, be on the lookout for opportunities to optimize your transportation program. Maybe your RFP should consider modal conversion or the opportunities for lane aggregation. After a set time, once your new RFP is in place, look at the numbers in comparison to your baseline. Are they trending in the manner you had hoped? Preparing for measurement and analysis is a plan for success. You will need to create a system of checks and balances for the RFP process to help secure the best outcome for your business. Define the communication pattern so you have a game plan to reach out to the participants after each round. We also advise an open line of communication with carriers and providers throughout the course of the RFP. Pro tip! Do not provide target rates in your initial RFP. It could adversely impact the results and cause you to overlook providers that are a great fit with your operations. You prepared and administered your RFP. Now what? Once your freight has been awarded, there is still more to do to get the trucks rolling. Onboarding calls are very important to make sure you are on the same page with each provider regarding service levels and volume commitments. You put a significant amount of your time and energy into the RFP, work to make sure it was worth the investment. 3PLs are a vital part of success in most supply chains. Your carrier strategy likely endorses a mix of 3PLs and asset-based carriers. We provide the value of strategy and solution that only a 3PL can. If our networks compliment one another, we will be a trusted resource to help your company succeed in hitting the goals of your RFP and beyond. Submit your RFP to inquiry@agforcets.com. Leawood, KS — Agforce Transport Services today announced that it joined the SmartWay® Transport Partnership, an innovative collaboration between U.S. Environmental Protection Agency (EPA) and industry that provides a framework to assess the environmental and energy efficiency of goods movement supply chains. Agforce Transport Services will contribute to the Partnership’s savings of 215.4 million barrels of oil, $29.7 billion in fuel costs and 103 million tons of air pollutants. This is equivalent to eliminating annual energy use in over 14 million homes. By joining SmartWay Transport Partnership, Agforce Transport Services demonstrates its strong environmental leadership and corporate responsibility. “As a broker, we are conscious of the carriers we choose to move freight in our network, currently partnering with more than 300 SmartWay carriers. It’s not an easy designation for carriers to achieve, and it speaks to their overall quality and dedication to sustainability. We see this partnership as invaluable to our green efforts and the overall environmental footprint of the freight industry,” said Andy Tuley, Vice President – Business Development. Developed jointly in early 2003 by EPA and Charter Partners represented by industry stakeholders, environmental groups, American Trucking Associations, and Business for Social Responsibility, this innovative program was launched in 2004. Partners rely upon SmartWay tools and approaches to track and reduce emissions and fuel use from goods movement. The Partnership currently has over 3,000 Partners including shipper, logistics companies, truck, rail, barge, and multimodal carriers. Agforce offers streamlined and flexible services helping companies dramatically improve their supply chain. We deliver the most effective solution for your business to help you ship your product where it needs to be — when it needs to be there. Together, we can simplify logistics. For more information about Agforce Transport Services, visit agforcets.com or call 844.713.6723. High demand and favorable market conditions mean most LTL carriers find themselves firmly in the driver’s seat when it comes to pricing and choice of freight as we enter the second half of 2018. Peak shipping season occurs during the third and fourth quarters along with contract negotiation between many shippers and carriers. With LTL companies already operating at full capacity and the undeniable impact of freight rates on profitability for most companies, shippers will be better prepared for what’s ahead when you understand the why behind the current state of the LTL market. While the economy is certainly a catalyst of LTL demand, there are other contributing factors. Tight LTL capacity also stems from the changing retail landscape (brick-and-mortar to ecommerce), spillover from full truckload demand, available equipment, and competition for available drivers. The “middle mile” of ecommerce shipments are often handled by LTL carriers. With a 16 percent growth in online retail purchases in 2017, and little sign of slow-down in 2018, ecommerce will continue to impact LTL capacity. Some carriers have adjusted operations by adding hubs and service centers to accommodate the industry, including their more rigid on-time delivery expectations. The overly saturated truckload market has some shippers looking to LTL carriers. That being said, heavy partial truckload shipments are not always ideal in LTL carrier operations. This has many carriers weeding out the freight that does not complement their network. According to an article from Supply Chain 24/7, LTL carriers have not added much equipment to their fleets in the past few years. They speculate, however, that even a surge in available trucks would not have much impact due to the driver shortage. Several growth sectors, including construction and manufacturing, share a workforce with LTL carriers. Competition within other industries that may offer more lucrative opportunity is a challenge for LTL carriers. The driver shortage of the truckload sector has not yet had a large impact on LTL. The benefit of high demand for LTL carriers is revenue growth — which is up 10% or more through volume or yield gains. It is not all roses though. There are challenges for carriers operating over capacity, and shippers are likely to feel it. Carriers are maximizing profits, in part by weeding out freight that is less profitable — not a good fit for their network or operations. They are using pricing initiatives that make the shipments costly and ultimately leave shippers disinclined to tender freight that carriers find unattractive. With carriers’ eyes on profits and high demand in the market, freight shipping rates are likely to continue increasing during shipper-carrier contract negotiation the remainder of the year. Prices will go up, but do not expect service levels to do the same. Most LTL carriers are not operationally equipped to handle this surge in demand. Shippers will need to prepare for inconsistent transit days and allow time in their supply chain for things like missed pickups and late shipments. Together, we can simplify logistics. Contact us today for a free consultation. Give us a call at 844.713.6723 or email us at inquiry@agforcets.com. From the alarm clock you snooze in the morning to the TV you Netflix and chill with at night, it’s likely you have a truck driver to thank for making all the things you need, want and enjoy in your life accessible. We appreciate our driver partners every day, and we love the spotlight they enjoy during National Truck Driver Appreciation Week. It is a great time to reflect on all they do to keep our nation connected. Let’s take a minute to explore the importance of truck drivers. They are undoubtedly the center of the freight industry, making it possible to move goods from here to there. Could they also be the hub of our general society? Think about the important institutions that would have trouble obtaining resources without truck drivers, like hospitals or prisons. In an article by TruckerPlanet.net, they consider a world sans drivers. Their article states in the first 24 hours without truck drivers hospital, service station, and manufacturing operations would be impacted, as well as food supply. In the days that follow, supplies would become scarce and food shortage would be a concern — not to mention waste build up. Imagining this scenario makes it quite easy to give thanks to the men and women that help keep us cared for and fed. It also shows just how important the trucking industry is to our national economy, contributing nearly $739 billion in revenue a year. About 70 percent of all freight tonnage is transported by truck, and 80 percent of U.S. communities are supplied by trucking deliveries. There are currently 15.5 million trucks in operation traveling more than four million miles of roads. We imagined a world without drivers, but even a drop in the number of truckers on the road would have significant consequences. It would almost immediately translate to slower delivery times and higher priced goods. Let’s not forget what truck drivers give up to help us stay connected and productive, starting with the time they spend away from family and friends. Driving about 125,000 miles a year, they may have around 3 weeks between nights in their own bed. In addition, a truck driver’s health can suffer. Over the road drivers may not have a lot of choice when it comes to healthy food selection, and sitting for long periods of time is not good for anyone. Seeing a doctor or health care professional in general can be a challenge for truck drivers with their schedules allowing for limited time at home. And how can we not mention the dangers drivers face on the road itself? We need our drivers safe. That is easier said than done when you’re hauling 45,000 pounds or more during rush hour in Chicago, in the dark of night around sharp corners, or in frigid conditions while snow starts to accumulate. That is more than most of us would be willing to put on the line. It takes a lot of skill to navigate the roads in a truck. Long story short, drivers do more for us in our everyday life than what is typically recognized. From keeping gas in the stations to apples in the store, they keep us connected to the goods we cannot live without – often at a cost to their personal lives. With that in mind, let’s remember to thank our hardworking truck drivers during National Driver Appreciation Week, and every day that follows. They truly deserve respect and appreciation for the work they do to keep our country moving. The U.S. trucking industry is short of drivers—about 50,000 short, according to an October 2017 estimate from the American Trucking Associations (ATA). The developing driver drought is a critical issue that has captured the attention of the trucking world: In an annual survey conducted by the American Transportation Research Institute, driver shortage ranked first among industry concerns. Freight volumes are on the rise, thanks to healthy commerce and a strengthening economy. The average driver age for commercial truck drivers in the U.S. is 55, and 25 percent of current drivers near retirement age. The trucking industry is having trouble attracting younger people to the profession. One issue is that prospective drivers must be 21 years old to hold an interstate commercial driver’s license. That typically means three years after high school, by which point many potential candidates have pursued jobs in other sectors. A range of federal regulations—most recently the Elog mandate put in place in April—require truckers to track the time they work, which can impact productivity, and thus pay. The long hours and requirements of the job can limit its appeal. Most drivers—especially newer ones—are on the road for extended periods of time, returning home only a few times a month. Adapting to life on the road (showering at rest stops, limited dietary choices, safety issues, and more) can make the job less appealing to some. Drivers must pass a DOT (Department of Transportation) physical at least every two years. Some with specific health issues must do this annually. A lot of times the driver must pay for the physical out of their own pocket. Sleep apnea and diabetes can disqualify a driver if certain criteria are not met. Carriers cannot find drivers that can pass the required drug test at hire and then randomly throughout their employment. The ATA estimates that because of industry growth and retirements, the trucking sector will need to recruit nearly 100,000 new drivers every year to keep up with the demand for drivers. The shortage is particularly acute in the long-haul, over-the-road truckload segment. Try to expand the demographic. For example, women currently make up only 6 percent of the truck drivers. Some observers see veterans seeking career transition after military service as another good potential source of prospective truckers. Continue to boost driver wages. The national median for truck driver pay is $53,000, which represents a $7,000 increase from the previous year. For private fleet drivers, the pay increase is up $13,000. Decrease time on the road. Trucking companies can address lifestyle issues of the profession by offering route options that are closer to drivers’ homes, reducing the long-haul lifestyle aspects of the job. The truck driver shortage affects the entire economy and could have a significant impact on supplier costs and shipping delays. Agforce Transport Services monitors and tracks trucking industry developments like the driver shortage to provide informed consultation to customers. Agforce specializes in customized transportation solutions for our customers’ specific business requirements. To learn more about how we can help address your company’s needs, contact us today for a free consultation. Give us a call at 844-713-6723 or email us at inquiry@agforcets.com. https://agforcets.com/wp-content/uploads/2018/07/truck-driver-shortage.jpg 321 835 Jen Whitson https://agforcets.com/wp-content/uploads/sites/9/2015/07/Agforce-Transport-Services-logo.png Jen Whitson2018-07-13 07:58:312018-07-13 07:58:31What’s Driving the Trucker Shortage? A capacity crunch in rail shipping is occurring earlier in the year than anticipated has the industry bolstering for substantial and sustained price hikes. Shippers should be aware of this trend. Rail prices are expected to continue to rise over the course of the year. Market observers are pointing to fully booked rail lines on freight routes out of Southern California as an anomaly that indicates the trend, since the current level of demand typically doesn’t take hold until later in the year. Experts are anticipating unprecedented pricing peaks in rail prices in late summer and into the fall as many factors push more freight to railroads, including overall strong economic growth, a shortage of truck capacity, rising diesel prices, and reduced driver productivity attributed to the electronic logging device (Elog) mandate. Total domestic intermodal traffic expanded 7.4 percent year-over-year in the first quarter of 2018 (the strongest gain since the second quarter of 2014), according to the Intermodal Association of North America, as shippers that could not find truckload capacity turned to the rails. The four-week moving average on U.S. intermodal is up 7.9 percent, according to the Association of American Railroads. The Cass Intermodal Price Index rose 6.6 percent year over year in April to 141.9, close to the all-time record of 143.2 established the month before. The three-month moving average is up 5.9 percent. With capacity so tight, shippers will need to be more proactive and flexible than ever, and look to lock up capacity as soon as it is available—especially smaller shippers that don’t have predictable volume and weren’t able to lock in capacity contracts earlier on. Those shippers will need to rely on the spot market to find capacity at a time when prices are at record highs. All of that means shippers are likely to face a difficult year of negotiations and decisions. And in unpredictable markets like the current one, experienced partners and advisors are more important than ever. Agforce Transport Services monitors shipping markets closely and advises our customers how best to navigate the volatility that typically characterizes the market. We can help shippers navigate market fluctuations and better manage rate volatility by leveraging a wide variety of carriers. Agforce specializes in customized transportation solutions for our customer’s specific business needs. To learn more, contact Agforce today for a free consultation. Give us a call at 844-713-6723 or email us at inquiry@agforcets.com.